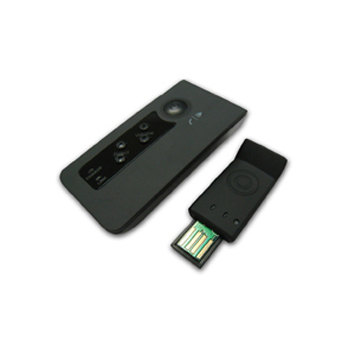 This Wire-to-Air 2-Way Wireless Audio Adapter with Microphone - AWS8212 canchange your audio entertainment environments, or computer conversations, to wireless. You can move without the limitations of a cord and still get the high fidelity, stereo sound you expect up to 30 meters. Perfect for in-home use with PC / NB / Tablet using an USB port. Simply plug the transmitter into your PC and sync it to the receiver, connect your own earphones or headphones and enjoy high-quality sound wirelessly with crystal- clear digital sound quality. 2.4GHz digital FHSS technology for improved interference resistance and smooth audio streaming. Compatible with all types of earphones and active speakers or stereo system. 360° omnidirectional transmission and reception for free-roaming of up to 100ft. radius. Dual uses of wireless headphone and wireless headset for stereo sound and voice. Auto mute when no audio input. Built-in Li-ion rechargeable battery & charger for receiver. Built-in omnidirectional microphone in receiver. Listening to music from any multimedia player with PC USB port. Talk and listen on Skype / MSN / QQ / Yahoo! Messenger.., etc. wirelessly with your own earphones.